Mijas is one of the few towns in Costa del Sol that maintains its physiognomy and idiosyncrasy despite the touristic boom from the fifties. 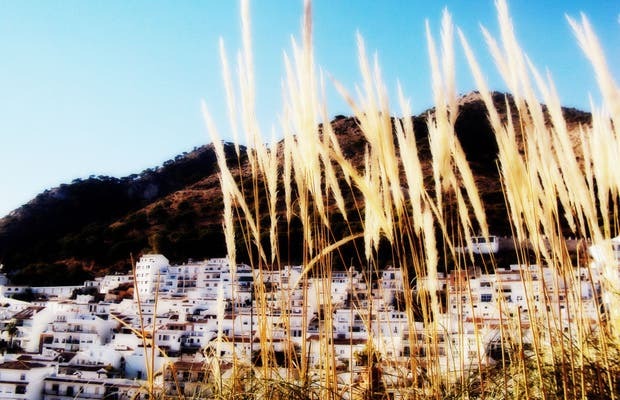 To walk in Mijas is to do a route through the Andalucía of the “Álvarez Quintero”…white houses, facades with flowerpots, patios with flowers and even “donkey-taxis” that allow you to get to know the streets and corners of this pretty town. It used to be called “Tamisa”, in the times of Roman occupation, and it had an increasing commerce, since it was part of the Vía Apia that joined Málaga with Cádiz. They also contributed to the construction of its orchards and terraces, and of its first vineyards. It is a beautiful town. It is great to walk its narrow streets, see its gardens and to sit down in one of its many sunny corners. Everything makes you feel part of the surroundings. The feeling of peace that the place gives makes time fly by without even noticing it. You have to visit it; you will fall in love with it. From the chapel you can enjoy spectacular views of the coast. It is really a beautiful place. I was surprised with how well taken care of the gardens are. This last summer we were able to go back for an afternoon in the pretty town of Mijas, a town that we have always liked since it is full of nice and well preserved places for tourists. In its streets and establishments we find nice objects, good restaurants and bars, shops and jewelry, great panoramic views from its walls, and where we can enjoy a sunset over the coast and mountain. Circling its streets and squares we find a very special and natural means of transport…(they work with hay!!) that helped many generations of humans as “great friends for transport”…if they could talk! We call them donkeys. It is a beautiful town with amazing sunrises. It was great to visit it in low season, since it is really crowded in the summertime. Moreover, in winter the weather allows us to walk and enjoy the sun and beach without a problem. The hotels are also cheaper in low season both in Mijas and in Fuengirola, which is also a very pretty place. Con los asnos como emblema.